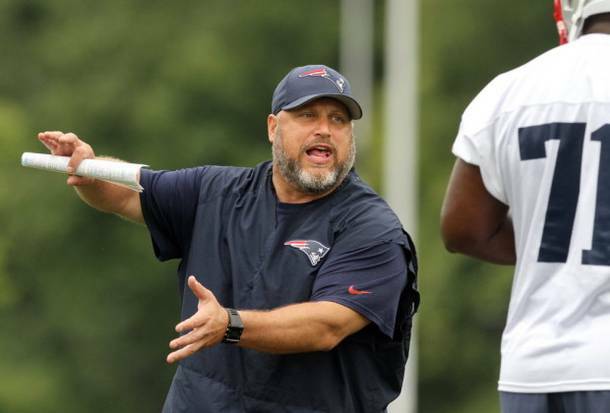 After having spent previous stints with the New York Giants, Miami Dolphins and New York Jets, DeGuglielmo joined the New England staff last season by taking over for longtime OLine coach Dante Scarnecchia. Dealing with injuries all across the line in 2015, DeGuglielmo was piecing together the five-man unit on any given drive, game-by-game. However, the line as a whole through 18 games this season was poor, and yesterday's Title Game in Denver saw the entire unit fundamentally collapse against a frenzied Denver front. The inability to adjust and get players in focus has seemingly cost the veteran coach his job.